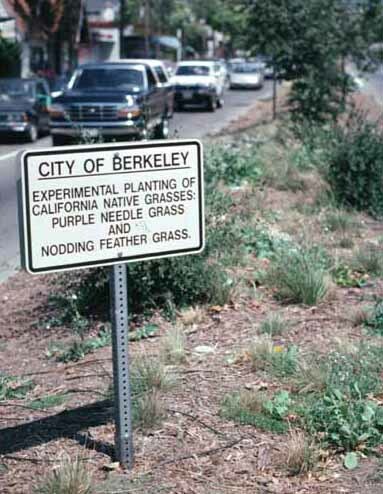 An example of utilizing California native grasses in a roadside urban landscape. An example of utilizing California native bunch grasses in a roadside urban landscape. An example of utilizing California native grasses in a roadside urban landscape. It failed within a year after this picture was taken, why? This landscape was installed four months prior to this photo being taken, using gallon container stock spaced on 1-2 foot centers, mulched with wood chips and drip-line irrigated. The planting was completely overwhelmed by European annual grasses and exotic weeds less than a year later. The Reveg Edge, Box 361 Redwood City, CA.